Three experiments which had been designed by high school students were launched to the International Space Station on June 29, 2018, on board the SpaceX transport shuttle. 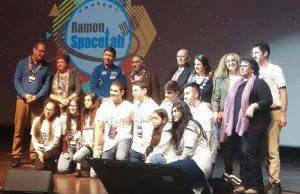 The three experiments, chosen from amongst 12 competing teams, were launched in the framework of the Ramon Spacelab programme, led by the Ramon Foundation and the Israeli Space Agency in the Ministry of Science. One of the experiments launched was created by students of Sci-Tech Dekel Vilnai High School, Maale Adumim. It aims to examine the effects of micro-gravity on the amount of precipitation created by osteoblastic cells, under the influence of amorphous calcium. The experiments will be overseen by the ISS astronauts, who will record the effects of micro-gravity on the behavior of various materials, and the results will be sent back to Earth in about two months.